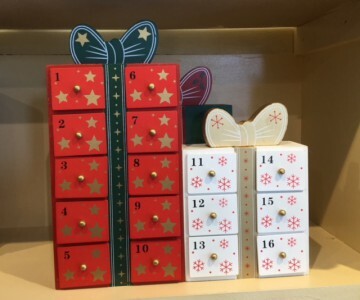 A wooden advent with 24 numbered large boxes for treats. 1-16 on the front and 17-24 at the back. Welcome to ‘The Christmas Shop in Lechlade-On-Thames’. We are the oldest Christmas shop in the UK established in 1985. Our roots began from selling traditional German Christmas products which are still available to buy in the shop today. We are open all year round selling beautiful Christmas items and stock a wide range of products. Opening hours do alter during the year, so please check Visit Us for updated information.